Lace is undoubtedly a luxury item but it was first made in Ireland as a direct result of poverty. During and after the famine years, in the mid 19th century, training centres were set up as a means of charitable assistance to the impoverished Irish population. Some were started by Church of Ireland clergy or their wives, others by philanthropic landowners and quite a few by Catholic convents. Initially all of these places took a lace making style from elsewhere in Europe and taught it to local women and girls but gradually the Irish styles forked away from the original ones and distinctive methods of working evolved in each locality. Irish lace gained an international reputation for the fineness of the needlework and the intricacy of the designs used and lace making flourished in many places until late in the 19th century. After that it rapidly declined, chiefly because Ireland, then quite a backward place where the industrial revolution made little impact, was unable to compete with readily available and much cheaper machine-made lace. By the mid 20th century the craft of lace making had largely died out and the traditional skills were kept alive by just a few enthusiasts in each area. There has recently been a revival of interest in lace making and there are now many people doing beautiful work in both the traditional style and contemporary version of old styles. It is still a slow, painstaking process to create lace by hand, so lace is not something you will find in most gift shops but it is well worth seeking out. There are just a few lace makers left today creating lace in these traditional Irish styles. Their work is sought after, but is definitely not a bargain buy – the work is slow, painstaking and skilled, and prices are hight. It is sometimes possible to find antique lace still, though it is increasingly rare and correspondingly increasingly valuable. This style of lace making is very distinctively Irish, with patterns, usually of flowers and leaves, built up in layers resulting in a three dimensional effect. Entire items of clothing, such as christening robes and wedding dresses were made in this way. 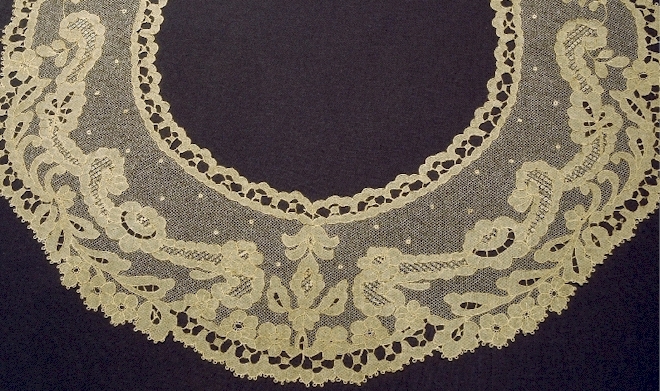 The origins of this style of lace is unclear but it was probably brought to Ireland by nuns who had learned similar techniques in France. Quite often the pieces were made by more than one person, with someone expert in, say, creating roses doing just that and another creating leaves and so on. Finally someone would take all the pieces and join them together into the final completed piece. In the 1950’s and 60’s couture designer Sybil Connolly, whose work was international known and particular popular with the style conscious and wealthy in the USA, incorporated hand made crocheted Irish Lace in many of her designs and was single-handedly responsible for something of a revival of the craft. Associated with the town of Carrickmacross in Co Monaghan, this style of lace owes its existence to Mrs Grey Porter, a local rector’s wife, who brought some appliqué lace home from her honeymoon in Italy. Later, looking for ways to provide work for women from the impoverished local population she established lace-making classes, initially copying the designs of the Italian pieces. Other wealthy individuals in the area followed suit and during the famine these provided a very much needed source of income in the area. The local lace evolved from the Italian style and became very distinctive. The laces is made by first made by attaching fine muslin to a net base, with the main part of design outlined in embroidery on both the muslin and net. The surplus muslin is then cut away, leaving the pattern on the net base. While many other styles of lace died out in the early 20th century, Carrickmacross lace remained strong, primarily thanks to the St Louis Convent in the town whose pupils continue to be taught the craft right to the present time. Lace makers in the area now produce lace mainly by commission and often for fashion designers. Princess Diana’s wedding dress had sleeves decorated with Carrickmacross lace. Lace making was introduced to Clones by Cassandra Hand, the wife of a local Church of Ireland rector, again with the purpose of providing work locally. It was initially based on Venetian lace, an embroidered lace, but the method evolved into one of crocheting the very fine threads onto a mesh background. The hooks used were extremely fine – about the size of a small sewing needle. A characteristic is the use of the ‘Clones Knot, created by turning the hook several times around the thread. This creates a ‘nub’ on the finished work which is characteristic of Clones lace. The proportion of crochet to embroidery can vary quite a bit. The lace making tradition did not die out in Clones at the start of the 20th century as it did in other places, as late as 1940 local lace makers contributed to the dress worn by Queen Mary during her coronation and Clones lace was used by many linen makers in Northern Ireland to decorate their products. However after the 2nd World War the decline of the Linen industry saw a parallel decline in the fortunes of Clones Lace. When the Poor Clare nuns established a convent in Kenmare in 1861, not long after the end of the Irish Famine, they could see that the local people were in dire need of employment. Lace was first made in a workshop at the convent, and at first was typical Irish Crochet lace, but later the fine needlepoint lace that became associated with the area evolved. Initially this was primarily sold in a local hotel much frequented by wealthy visitors from England and Dublin, who flocked to this fashionable area during the summer. Later it was exported to Paris and London. The lace also became very popular on ecclesiastical gowns and many bishops and cardinals from all over the world commissioned work from the nuns. Extremely intricate, Kenmare lace is created by first tacking the outline of a design onto two pieces of cloth, one a fine netting, the other a more robust backing cloth. The patterns of the lace are then stitched by working from the tacked on design, but with the stitches attached to the finer cloth only. When the pattern is complete, the tacking stitches are cut and the background cloth falls away leaving the completed lace. Inishmacsaint is a small townsland in Co Fermanagh where a unique style of lace making flourished during the late 1900’s. The initial lace is made by following an outlined design stitched onto a background cloth overlaid with muslin net onto which the actual lace is embroidered. In this way it resembles Kenmare Lace. Once the piece is complete the background cloth is cut away and then additional outlining is sown onto the lace to give a raised effect around the important elements in the design. This outline is created with a thicker thread than the rest of the lace and may even be oversown with fine buttonhole stitching. Aside from a very few local enthusiasts there is no lace in this style made today and antique examples are rare and very sought after. One of the earliest known Irish styles, Limerick Lace was from the outset a commercial venture, brought to the area by Charles Walker who established a training centre and workshop in about 1830. By 1850 it had become popular and prized by wealthy and fashionable ladies all over Europe. It is extremely light and delicate in style, with designs embroidered in tiny stitches onto a very fine mesh backing cloth. Usually the backing mesh was stretched over frames and the stitching applied to the taut fabric, but some was worked without the use of a frame. Little Limerick lace is made nowadays, but a lot was made in the years between the establishment of the factory and its demise in the early 20th century and antique pieces are still quite widely available. This is really more embroidery than lace and is almost always worked on linen. In the 19th century, when the linen inductry in Northern Ireland was at its height, a lot of whitework was carried out in Belfast and surrounding areas. It is a style also associated with Mountmellick in Co Laois. The reason it comes under lace styles is the characteristic drawn thread edgeings used to finish whitework pieces. The edges were created by drawing threads from the linen base fabric to create a fringr. The remaining threads were then moved and covered with embroidered buttonhole stitches to create a laced edge, usually in a geometric pattern. There are two common types of machine-made lace. In the first type, cutaway lace, the lace pattern is machine embroidered onto fabric and then the fabric is cut away, again by machine, leaving the holes which give the appearance of lace. It is usually quite easy to spot the remnants of the fabric around the edges of the stitching which are characteristic of this technique. The second type is chemical lace and this is the way in which Irish Crocheted lace is usually made by machine. In this method the stiching is done in a natural fabric, usually cotton or linen, onto a synthetic fabric background. The finished piece is then dipped in a chemical solution which dissolves the synthetic fabric leaving just the stitched lace. The result is very close to hand made lace in appearance. While there is nothing at all wrong with machine-made lace, and it is certainly a lot more affordable than the hand-made variety, you do need to watch out for people attempting to sell ‘antique hand-made Irish Lace’ which is actually chemically made and stained to look old. It is not a common practice, but be on your guard. Buy antique lace only from reputable dealers, not at market stalls or street fairs. Hand-made lace is expensive and good quality antique examples especially so. If a piece seems like a bargain, it would be wise to wonder why. Several of Ireland’s larger museums will have examples of, and occasionally exhibitions devoted to, Irish Lace. You should certainly be able to see some in the National Museum of Ireland and the Ulster American Folk Park. Look out for local Craft Fairs or ‘Sales of Work’ as you travel around. These are often used as outlets by individual lace makers whose work is not available for sale otherwise. The following are some places devoted entirely to lace, with links where we could find websites. Rosemary Cathcart, owner of this private collection, has assembled a stunning array of more than 400 exhibits here, covering just about every style of Irish Lace, as well as Wedding Dresses and Veils, Shawls, Parasols, Collars and Jackets and many other items either made from lace or incorporating lace in their design. A shop at the museum sells antique Irish lace and linen. Lace maker Mary O’Neill’s gallery includes a collection of old lace including Kenmare Lace, Borris Lace, Clones Lace, Torchon, Tatting, Venetian Needlepoint and various bobbin laces. Beautiful contemporary Carrickmacross lace designs made by Mary O’Neill can be purchased at the gallery or online at her website. She also takes commissions. Close to the tourist office in the town of Kenmare this small shop has an interesting exhibition of old lace and also sells the work of local lace makers. Alongside the tourist office here there is an exhibition of the Clones style of lace making along, both old and new, with some items made by local lace makers for sale. How to Behave in Ireland! I have inherited my mohter in laws irish linen table cloth, that has got embroidered shamrocks all over it and has the edges done in cotton lace, its massive, she was given it by an elderly Irish lady of near 90 & that was 30 years ago, it has embroidered in one corner in red thread a number 466, how do i find out the history and how old it is and who and where is was made and for who please. I am looking for irish lace curtains with little shamrocks on the curtain,do you carry them or do you know where I can find them. I recently found an old table cloth that I believe was my great grandmother’s. I’ve talked to relatives and believe it to be an Irish lace tablecloth as my great grandmother was from Ireland. The tablecloth itself is fine lace with a border of decorative lace. In the center, there is a clover with smaller clovers in the four corners. It is VERY yellowed. I’m looking for some recommendations of where to have it restored/cleaned (I’m too scared to attempt cleaning it myself). I live in southern California but am willing to ship it if need be. Any suggestions are welcome! Please what can I do with a trunk load of lace, its been in the family for decades, and just stored in a trunk in the attic !!! ? I would think that if you contact and auction house or antique dealer in Ireland, you would find they would be very interested in your lace. If you’d like it presevered in a way that would allow people to see and enjoy it, the Lace Museum or some of the heritage organisations in the town where lace was made would be very pleased to hear from you. Where can I purchase Irish laces? Can they BB e shipped to England? I don’t blame you for not wanting to take your lace dress to a drycleaner…few, if any, would even try to clean it, being that old. I clean old linens and lace often by using a modern product, Clorox2 crystals. First, dissolve about half a cup of crystals in maybe a gallon of very hot water. Be sure the crystals are well dissolved. Then just mix that liquid thoroughly into a large container (bathtub will do) with several gallons of warm, not hot, water. I am guessing that your lace will tolerate warm water, or just use cool water if you’re not sure. Now, be sure the dress is completely immersed in this solution, or make up more, if needed to cover it. Let it soak for several hours — I actually soak things overnight if they seem sturdy enough. This will clean and whiten your dress without doing harm, IF it can tolerate being soaked in water. Afterwards, rinse the dress at least three times…very gently. Then gently hand-press (do not rub or wring) excess water from the dress and dry it in the open air. I like to spread an old white sheet out on a dry lawn and let it dry in the sun. The sun will also do wonders to whiten and freshen your item. I suggest you turn it a time or two while it drys in the sun. Colored items should be dried in the shade, out of direct sun. DO NOT, UNDER ANY CIRCUMSTANCES, WASH OR DRY IN A COMMERCIAL DRIER. This WILL ruin your item…honest! Old things have do be cleaned the old way — only! You might practice on something similar/small/inexpensive before doing this. Best of luck. I love them, too. where can i learn needlepoint lace-making – in the Limerick area? I have found this site to be very informative. My daughter has just purchased a very elegant new home. There is a single window in her dining room and I was hoping to buy Irish lace curtains for that room. I also wanted to buy her a tablecloth, hopefully one that would match or blend. Do you have any recommendations? Is there anyone in the Kilarney/Kenmare area that teaches Irish lace making – especially crochet? I’m planning on visiting soon, and would love to be taught this craft. We do teach Kenmare needlepoint lacemaking at The Kenmare Lace and Design Centre. We give regular weekly classes in the off season and you can also book a privater lesson. Hi, I have this idea of starting Irish lace in african villages for export. I thought is something that requires little investment, apart from lessons, they don’t even need to know how to read, they get paid as little as $60 a month, may be it could be profitable? May be someone could go there and teach them and then sell it in Ireland for a fraction of the price. Sorry crazy idea. I must say that I like this site verry much. You must forgive me if my wrighting is a bit poor because I’m from the Netherlands (I’m Dutch). I specially like the topic on Irish Lace crochet. I love to do crochet and knitting and I am always looking for special paterns. Now I saw this topic and I immediatly fell in love with this kind of craft. I began to search the net, but there is verry little to find on how I can do it myself in my country.